When I was a kid my Nana would make a cheeseball at Christmas time that I always loved. Recently I decided I was going to make the recipe myself. I added the ingredients to my shopping list which were your common cheeseball ingredients, then I came to this… Summer Savory! I had never heard of this spice in my life. I had never even seen a recipe that required it. I did my homework online only to find out it wasn’t a combination of spices but an actual spice called summer savory and apparently there is a winter savory too. After a little digging the only brand I could find was Spice Islands that even mentioned having it. 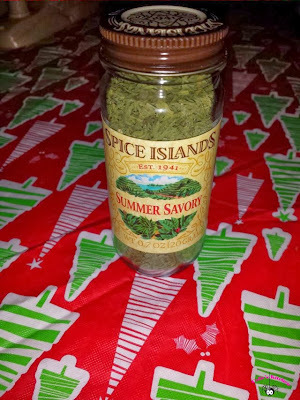 Then after 3 different grocery stores I found it and yep it was Spice Island, but wow the price! I paid almost $6.00 for this small bottle! It’s probably a good thing I don’t have any other recipes that require it. It’s a bit too pricey for me, but as my husband put it, you only use 1/8 a teaspoon in the recipe so it should last awhile. Have you ever used it in a recipe?